Dave's work has been featured on many TV shows and in movies. There have been numerous articles and Dave's images have appeared in South West Art Magazine, Trail Of Painted Pony's collector Books, Phoenix Home & Garden and Fender Guitar Catalogs and the coffee table book,The Dream Factory History of the Fender Custom Shop. My collage work is heavily influenced by life's objects - signs, buildings, music, advertisements and nostalgia. Sometimes my art begins on the side of the road where I've found an interesting object. I search garage sales, junk yards and antique swap meets for items I can work into a painted collage construction. 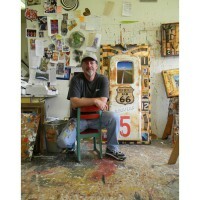 I use photos I've taken, acrylic paint, wood, metal, silkscreened images and found objects to weave a story with my art. I want people to draw their own conclusions when looking at my work. I want them to look and look again because there is always something else to see. When I'm not working on collages, I paint. My acrylic paintings on canvas and wood are spontaneous commentaries on Pop Culture, i.e., coffee cups, television, hearts, and the spaces we live in. They are created with a fun & whimsical feel because I tend to view life in that way.